Just Doors UK has always worked on the principle that not only should our double glazing doors and windows be excellent value for money - so should our service. That's why we really value the feedback we get from our customers. Here you can read reviews from just a few of the many thousands of customers who we have helped improve their homes with our top quality double glazing. Still not convinced having read some of the reviews below, read the independent reviews on the Review Centre and Trust Pilot websites. Just Doors UK 4.93 out of 5 based on 383 ratings. 501 user reviews. Please read the latest reviews left by our customers. The new door is fantastic. It has made such a difference to the room. It's warmer and quieter. The dog is a little confused as he keeps trying to go through the small panel as that was where the naff sliding door used to open. We are trying to teach an old dog new tricks! It may take a while! Many thanks! Very pleased with my purchase, fits perfectly. I was very happy with the service as and am happy with the quality of the door. I would certainly recommend you. Thanks for the great quality product it?s made a massive difference to my house!! I am very pleased with the door you supplied, delivered on time and good quality. We got exactly 'what it said on the tin', excellent quality and service would recommend to anyone! Just Doors & Windows are a fantastic company, the website is very easy to use which makes selecting the configuartion of purchasing windows and doors incredibly easy. We had become so fed up of traipsing pushy contractors around our home and being told what we want, but fitting yourself really isn't that bad. The installation guides provided were excellent, they maintained good communication to keep us up to date with our order, delivery was prompt and to top it all off, it came in as half the cost quoted by contractors. The addition of the doors, makes the garden look fantastic already. Thank you very much for the door and installation instructions. We think they look great and appreciated all your help. I am highly delighted with the door. Thanks for an excellent service, will be recommending you to others. Thank you, very pleased with the window. Thank you for a fantastic service and a great quality product. Thank you for marvellous service that you provided and the quality of the door is excellent. I would like to thank you for the superb doors! We were very pleased with our door, installing was easy and the quality was great, really impressed with the communication regarding delivery. My new door looks great! I am extremely happy with my door. Altogether a great service, nothing was too much trouble for Billy to sort out for us. Everything arrived when they stated it would, the windows we ordered look amazing, we're very impressed with the quality, they hold in the heat brilliantly? never had such a toasty house! Thank you to all involved in our purchase and delivery. I am very pleased with the door. We are absolutely delighted with the door, it looks brilliant! Fit perfectly and the quality seems very good. We are very please with the windows. I am really satisfied customer and my door and window look great, thank you for all your support and great service. We would like to thank you for the wonderful service we received from both your sales and delivery team. Our door arrived quickly and on time. The delivery driver was very helpful and reminded us that if we had any installation questions we could always call. The door was just as described and fitting was simple using your online guide. All in all we are very pleased with the product and would happily recommend you to friends and use the service again. I was very pleased with the door and how the installation went. Thanks for a great door and service. I would like to thank you for the assistance given during the ordering procedure and also for the excellent quality of the doors. Received door Monday fitted today. Excellent product. Cannot fault the service and quality of the items you supply. Thank you for such good service and good quality doors. Everyone loves the windows and door when they visit the house. Happy with the door and help I had on the phone. Door fitted now. Very pleased with it indeed. Many thanks for your excellent service and product. Thanks for the door it looks great. It is great quality and was easy to fit, even for me who is a first time DIY'er. The instructions were good too as was the customer service team who I called during ordering. Thanks. Really happy with service and product. Had lots of comments about the door and been passing your details on. Really happy with with the new doors. We love our new door, it's so nice! We have got our new door! We love it! Very pleased with result. ?Thank you for your excellent service. Very pleased with all aspects of the transaction. All looks good. Thanks for your help. The new door finishes off the new look of our front garden beautifully. Thank you. Thank you for another great door, such a quality product. The quality is great, a really solid door, easy ordering, on time delivery, easy to fit & looks great, love the colour. Thank you. I've had lots of comments on my new door and window! All good. l am really pleased with them! The whole process has been a breeze. Excellent service. Exceeded delievery expectations. Well packaged, good quality product! Ordering online was easy and user friendly. Fitting went like a dream with no adjustments needed, post-fitting. Installed with ease following your guidance, and has been totally problem free. Thank you guys really pleased with the door. Thank You for providing a great quality composite door and excellent service. I just wanted to say thank you for making the purchase of my new door so simple and easy - great customer service. To all at Just Doors. Just to say many thanks for supplying my door received as ordered fitted perfectly have posted a 5star review. Door is 5star, instructions very good and will recommend you to my friends. Installed my door this weekend. Looks superb thanks. Dear Sirs, With regard to the above order, I would like to thank you for the excellent, freindly and prompt service we received from you, the quality of the composite door is exceptional, so thank you once again. Kindest Regards Keith Hollobon. SW France. Hi there! Just thought I'd let you know the door was delivered on Thursday and fitted today. It looks fantastic. We couldn't fault the process from start to finish, and we'd recommend you to anyone. First door I've ever fitted. Pretty happy with it and your product is a fantastic quality. Thank you. Hi, Just a line to say thank you for your excellent windows which I have now finished fitting. I would recommend Just Doors UK Ltd to anyone who is in the market for buying UPVC windows and doors. Within only two weeks they have manufactured and delivered my French Doors and full height Windows on the day they promised and at a very competitive price. The quality of my doors and windows are outstanding and were so easy to fit using their online instructions. Thanks so much for this fantastic product. From order to delivery and installation ran very smooth. Would definitely use again. Many thanks, great service and product. Will be ordering again later in year. Excellent service, helpful members of staff on telephone. Excellent quality door, will and have recommended you to friends and indeed work colleagues. We will use you again for upvc windows next time. We are very happy with product which appears to be of high quality. I am very pleased with my new door and thank for all your help making sure I ordered the right size. We were delighted with the service provided by Just Doors and the product. We are quite happy with the doors and the service provided. We were very pleased with your service and the quality of your goods. Once again excellent quality, workmanship & price. My son has just bought his first house so will be in touch in the new year for a quote for doors & windows. Thank you for your help & service. Thank you for providing such excellent quality doors. The door looks good and value for money. It is high quality door. Product arrived safe and sound, as ordered. I then decided to have the professionals fit the window frame as I had never fitted plastic frames before! The fitter from S & H Windows Ltd of Retford commented on the quality and standard of the frame as excellent. All fitted together spot on I would definitely use Just Doors again. Excellent product, fast delivery and great customer service. Good products at very good price. Easy to install, although had to reset the doors on the hinges after installation. All instructions were easy to follow. Also was missing the glazing packers, but they sent them by return after querying this. Really happy with the door. Delivery was on time and it looks great! Thanks very much. This is my second purchase from Just Doors UK so pleased. Good communications, Helpful, quick delivery, on top of a very competitive price, what is not to like! This was a repeat order as was very impressed with the service and product supplied on previous order . Very happy with the product and swift delivery time. Many thanks. Friendly, efficient service. Call to confirm details and made recommendations that were very helpful. Delivered on time and in good condition. Very pleased with quality and price. Very pleased with the quality & price of my door. Don't go anywhere else. Great quality, service and value for money. Very happy with service. Door looks greats. The new door has made an immediate difference, it shuts out the previous noise so must insulate much more effectively than the old single glazed wooden item. Fitting was easy enough, I did it solo with a trolley jack, but 2 persons recommended. I had to seek advice from justdoors re. locking and after a little more adjustment to the hinges it worked perfectly. Really pleased with this item and fantastic price, service was brilliant and they delivered just when we wanted it. Would definitely use again. No issues, very happy with window. Will be ordering from them in future. This is the second installation I have completed and I am very happy with the composite door which was for my father's house. As usual, the product and technical support was excellent, as well as delivery and after sales service. Thank you! Somebody somehow hit the interior PVC frame carving a mark on the frame and the doors were jammed closed on arrival but later the customer service helped with advice and I was compensated for the marks. I am happy with Just Doors UK and the french double doors they made me. They resolved the issues and the issues with unusual marks, and I love the staff . The customer service people worked hard and tried for me from the start, beyond any disappointment I had. They were good on the phone, resolved problems and the doors are good quality. Amazing, responsible and fair. Great window correctly built to specification (sales checked before order confirmed) and delivered when they said it would be. Replaced a small, rotten back window. Now looks much smarter. I am extremely delighted with my new door and would recommend to others. The ordering process is simple and effective, very friendly staff and quick delivery. My door had some minor chipping at the bottom on the inside which is a shame but I didn't think it was worth making a fuss about. Other than this it looks very nice fitted and will hopefully be nice and warm in the winter months. I ordered a composite front door and a UPVC back door. Delivered to my front door by a really nice driver. The front door is beautiful and really well constructed. Looks exactly as it did on the online design portal. Easy to install and put together, I did it all myself. Very secure and the lock is very easy to operate. The back door is perfect. I chose the simply glass at the top. Very easy to install and very secure. Excellent Value. I could not find a door for a better price. My card declined (due to fraud protection) they guys helped me sort it out with their great customer service skills. Ordered a new door, topbox and frames to either side expecting to wait 3 - 4 weeks for delivery, but no. Just over a week and what great quality. Fitting is easy as long as you spend time making sure everything is plumb and square it goes like a dream. So far everybody has said what a great looking door. So far have had 7 windows and 1 French door from Just Doors and never a problem, great service and prices. Don't bother with anyone else go with a company people trust. From initial enquiry to placing my order and from delivery to aftersales this service exceeded my expectations. Professional and friendly staff dealt with my order and followed through with reassuring aftersales discussion. The door and window I purchased was high quality and precision made and my client is extremely pleased with the finished result. I will not hesitate in using JustDoors in the future, many thanks.? Very pleased with the service and product. First class service every time delivery drivers very polite. The French doors replaced a patio door and the change has been fantastic. We have better access to the house and the doors look amazing. Some weeks ago I purchased a door from you. A friend and I installed it in about three hours and we are very pleased with it. My new door has just been fitted I'm really impressed with the quality and the look of it. I'm really impressed with Just Doors UK the chap I spoke to on the phone for order was also very helpful and friendly. Happy customer - order, delivery, installation all without hitch. Helpful staff, kept up-to-date throughout and really good quality product & finish. Easy to use website, friendly helpful staff when you call up and delivery was much faster than original expectation provided. Second purchase from Just Doors, Window fitted perfectly and having done an installation previously we had no issues. Great service. My only minor problem was not one which many people will encounter: I cannot get a mobile phone signal at work so was unable to answer phone to confirm I would be in on the day of delivery, An email reply option might have improved this service. Thank you just doors for a great service from start to finish,fitted them myself as retired joiner , was dreading fitting the glass beads but was ok using rubber hammer and small piece of wood,looks really good had a lot of inquiries and they've only been in a day highly recommend. First Class service from start to finish. Great customer service and top quality door. Saved myself £400 by ordering and fitting myself. Everybody who has seen it comments on the quality and style and I recommend Just Doors 100% Thank You. Great price, really looks fantastic, quality of the door excellent, great customer service and delivery arrived when scheduled. Very good I would recommend this company. I will use this company again in the future. Just had a new back door, fitted and looks great.The door is great quality and very strong and half the price of anywhere else I could find, the staff were very helpful and full of advice. Good customer service, product exactly as described. Installation guide from the downloads section was extremley helpful. Another great door ordered from Just Doors! this time our back door. Looks amazing, price, customer service, delivery all fantastic, will definitely recommend. 19 out of twenty stars. Impressed with quality of the door, great customer service and delivery arrived when scheduled. Made to measure, perfect replacement for aged wooden rear entrance to garage. Screw fixings supplied for frame were replaced with hammer fixings due to hardness of the red bricks. Final result looks great. Good quality door and good customer service. Great price for great window and service. Saved myself £700 on the quote from a local company to fit a similar door. After a rather cold winter last year and big subject to a very drafty and cold reception area, it was time to invest in a new front door. We are so glad we found your website and we're able to so simply select the door of choice for us. Easy to use website, competitive prices and hassle free delivery....what more do you want?! We won't hesitate to recommend you after receiving so many positive comments on our new composite door. Thanks! Superb service and first class product. This is the second door I have purchased from Just Doors and I totally recommend them to anyone. Delivery was within a week, excellent service and fantastic quality. 5 stars yet again. Excellent service , great product and value for money. Ordered my made to measure french doors at the start of October and they were with me within two weeks as promised. Service throughout the process was excellent, phone calls to confirm order and arrange delivery. Delivery on date and time specified. Doors are excellent and half the price I would have paid for made to measure through the high street brands. Couldn't be happier! Another 2 windows fitted at weekend. We are really pleased with the quality of the windows and doors we have received from you. My brother in law is impressed and it takes a miracle to get a positive comment out of him! Too notch service with almost immediate replies to email enquiries and call backs from answer phone messages. A pleasure to do business with and we will be coming back for the next few windows in a couple of months time. Great service, fast delivery, very good quality doors! Very happy with my purchase. This is the first upvc window I've ever fitted and after some trepidation placed an order. All my questions were answered swiftly and the window promptly delivered. Fitting was straight forward and the quality really good. Only problem was it showed how bad my other windows are, so I've just ordered the second and now awaiting delivery!! Very pleased with the result. The Planning Control inspector said ours had weathered better than his. If you fit these DIY you must get building control permission before you start. If you don't it will cost you 50% more for a retrospective inspection. Great service from ordering to delivery.....and very happy with the finished product!!!! Very satisfied customer, great value. Very pleased with the quality and profile of the French Door. I was a bit worried about ordering online but upon delivery, the doors far exceeded the quality of B&Q and Wickes. The ordering process was easy and the customer service was excellent. Delivered in timescale quoted. Just placed my second order with them. Many thanks Just Doors UK. Being a DIY bodger at best I didn't rate my chances but with the cost of a professional fitting up to three times the cost of the door I had no choice. All done in few hours! Good quality, good instructions, very helpful on the phone when ordering, helpful and pleasant delivery driver, it is rare the buying experience is this exceptional. Thank you very much. Great service all round. Good quality product, speedy delivery easy to follow instructions. Installed the New French doors from Just doors and could not believe how easy it was, as long as you follow the toe and heal instructions you just cannot go wrong.Fantastic quality at a great price, great customer service and delivery. I highly recommend Just Doors, and will be replacing all the windows and front door in the coming months. I am very impressed with the quality and manufacture of the French Doors I recently purchased. The doors and the door furniture are of excellent quality, when looking for a set of doors, I looked at all the usual places, B&Q, Wicks, Homebase etc, and although these shops sold cheaper doors, I am pleased I didn't buy them as the build quality was far substandard and the door furniture/ locking mechanisms were awful. Such a great service from start to finish, from obtaining a quote online, to placing the order, to speaking to the team. I am extremely happy, the price quoted was great with delivery and packaging perfect. I will be placing an order for my porch next thank you. The door is a lot smoother to operate than our old pvc doors. I found the door easy to fit and the service and help I received during the ordering stage was brilliant. Never fitted a UPVC back door before, so was very pleased with the resulting installation. After being quoted £2350.00 to replace my old sliding patio door by a fly by night sign on the night dim witt salesman who never even took the time to measure the existing doors properly I decided to get a quote from my local company. Although they were cheaper the cost was still over £1500.00 ( Fully installed ) With some scepticism I placed my order with Just Doors. There were a few issues when my doors turned up but these were sorted very quickly and without any fuss. My son helped me install the new doors and we both commented on the quality of them being far higher than expected. It took us about 4 hours. The picture will tell the rest of the story. Great service and a well finished product. Very easy to fit. I would use you again. Very pleased with the whole service - door was delivered on the agreed date and at the agreed time. Would not hesitate to use Just Doors again, keep up the good work! Just a quick note to say a big thank you! Very pleased with my new door & your service. Would highly recommend your company. We found Just Doors a highly recommendable supplier. We had a 12ft double centre opening patio door and some windows. Excellent quality, very happy indeed. I bought a composite back door. Communication before delivery was good; delivery was on-time; quality excellent, and we are very pleased with the result. Possibly not a job for an inexperienced DIYer though. From start to finish, the process is simple, efficient and easy. I ordered a door and two upvc windows for a garage/storeroom, and the prices are amongst the cheapest for this quality of door and window (which is better than I have in my house). The salesman was helpful and informative, and delivery was exactly as promised. The fitting instructions are thorough and virtually foolproof to a layman like me. There was a very, very minor issue with a few small items missing, but the staff sent out the items without any drawn out argument that you can get with other companies. And from my point of view, it is how a company deals with an issue that matters. I cannot recommend this company highly enough, and would not hesitate to use again. Hello there, we would just like to say thank you for our french doors, they are super and they fit perfectly and the delivery man was very polite and helpful and delivered on the day and time you said we would recommend you to anyone. Fantastic door, easy to fit, looks good. This is the third time I have used Just Doors and have come back for value and service. Unless I move house, I shouldn't be needing your services again but never say never!! Would definitely recommend. This is an excellent product which arrived with full instructions and well packaged and all the bits were of the same excellent quality. We installed it in a few hours without experiencing any issues looking at the guide provided. I would recommend this product highly. I am pleased with the door which is very, very solidly made i like the 3 way locking system that it built in the door (one at the top, then the middle then the bottom) which they provide 3 single keys for also i totally 10/10 recommended Just Doors UK for your new front door or back door to be made and delivered by them. My second order from JustDoors - a couple of windows this time - and again great service from start to finish - even if I did break one of the windows during fitting - totalling my fault! Your service is magnificent. So glad I dealt with your Co. first class service and products all round. Would recommend you anywhere. Thank you once again best wishes to you. I have just fitted my new front door to my chalet with help from my brother who's a carpenter. He was very impressed with the quality of the door and it's mechanism's as was I. I had asked other window fitters for quotes to supply only and we're all much, much more expensive. I will definitely be advising anyone who asks me to use Just Doors UK. Just to say I thought the door I had from you 3+ years ago was excellent and easy to self fit. Now I needed help in adjusting the door the help was very forthcoming. Thank you again. Very impressed with service and quality of back door I ordered would highly recommend this company to anybody. Thank you for your prompt reply and advice, as always your service is impeccable. I will keep an eye on the post for the rubber seals and rest assured that when we are ready to order some extra new doors we will definitely be coming to Just Doors as the quality, price and service is far better than anyone else that we have encountered. Very happy with windows. Good quality. Look great! Thought fixing kit was expensive for what it was, otherwise excellent, already ordered another door. I found the doors we liked online, quote was very quick. Ordering was very easy and order delivery a week earlier than advised. Staff very helpful. Really pleased with end result and would recommend to others. Now here is a company that have great service and fully respect the customer all problems with the order were sorted very very very quickly GREAT JUST GREAT TO DEAL WITH. I just wanted to provide some feedback on the service I received from Just Doors, in particular Chris who answered all my emails promptly. I don't usually provide feedback but in this case the service and the product were excellent. Great service and top quality every time, I don't go anywhere else (trade). Excellent service from quote to delivery, all questions answered quickly. Service is much more transparent than other UPVC suppliers and also you dont have to pay others to install when you are able yourself! Very happy and would definately use again. Got to say bloody good value and quality, I've had a front and back door and french doors and very pleased with all of it recommend to anyone the guys were spot on with the sizes brill well done I'll be coming back for more soon. I just wanted to tell you how thoroughly impressed I am with your products and services. Having just finished fitting my new front door, I am highly delighted with the results! The door is exactly what I ordered, it was delivered exactly when it was promised, and it fits exactly into the wall. The quality and finish is everything I could have wanted, and the prompt service and attention to detail which I received from your staff was second to none. As a retired police officer and former Divisional Crime Prevention Officer for a midlands Constabulary, I was particularly impressed with the (optional) multi-point espagnolette retaining and locking system. This is to the nationally recognised Secured By Design standard and as such is recognised by insurance companies and is accepted as equalling the industry standard BS 3621 requirement which applied to the older type sash lock in the door I have replaced. I ordered two doors on 6th March 2015 by phone. I spoke to Kev and the ordering process was very easy. They were delivered on 19th March at 8am as promised. I've never fitted doors before but am an engineer and keen on diy. The fitting instructions on the website are excellent, particularly the toeing and heeling information. Both doors were easily installed in one day, the second one being much quicker than the first! 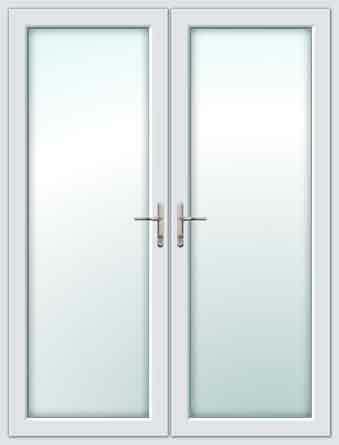 The doors are very high quality and close and lock perfectly without any adjustment. My wife and I are very pleased with the end results. The doors look absolutely superb. Great internet service, high quality proucts and excellent prices. Well done Just Doors. Excellent product along with excellent all round service. I and (importantly) the wife are delighted with this patio door. Its sturdy and good looking construction is a credit to the company. The free addition of Argon filled Pilkington glass has made a noticeable difference to the room. I would recommend to anyone. Adjustable hinges were brilliant, worth the extra cost. Installation was straight forward. Can't fault any of it. Great service right from the initial enquiry. Very helpful, delivery was spot on and drivers had no problem with carrying it up a few steps. Fitter was happy with the fitting, he said the quality was good. We love our new door and side panel, great price too. We are very happy with Just Doors UK. Door delivered on schedule and to specification. It was assembled and installed without problems after receiving helpful advice in reply to my telephone query. It looks good and operates smoothly without needing any adjustment. A little more information about removing the door from the frame would have been helpful and would have saved the phone call. The door has been up a year now, and I feel that I can give a honest review, that will help other people make the correct choice. As a returning customer who previously brought a set of French Doors, I found selecting and purchasing my door using the Just Doors UK web site was a breeze. The choices and options was vast, but not over the top. I eventually chose the 2 Panel 2 Angle composite door in blue. The price for my selection was unbeatable, I know, because I spent several days and many hours trying to beat it. Delivery was on schedule and it arrived well packed in perfect condition, with full instructions. Fitting was straight forward. Remove the door from the frame using the quick release hinges. Fit the frame. Re-hang the door. Simple. The quality of finish and security was second to none. Cleaning is just a matter of wiping over with a damp cloth, followed by a dry one. Twelve month's on and I am very happy with the door and time has demonstrated that I made the correct choice. I purchased a pair of french doors early last year to replace the up and over metal door in my garage/workshop. I was very impressed with the quality and robust structure of the doors and frames and I managed to install them myself without any real issues and only had to adjust the alignment etc. Recently one of the locks started stick and I thought is worth an email to Just Doors to see if they could help. The response was amazing, replacement lock cylinders arrived in a couple of days! I would and have, recommend your doors to anyone. My garage door and window had both started to rot so I decided to replace them myself. The Just Doors web site stood out because of the great reviews and good prices. I was slightly nervous about the job but the instructions on the web site looked fairly straightforward. Ordering by phone was easy and the details returned to me allowed a sizing error to be corrected. Within 2 weeks I received a call about delivery giving a 1 hour delivery slot. The driver arrived on schedule any everything was correct. Installation was straightforward once I'd bought a long enough masonry drill. I was very impressed by the door design. The instructions explained the importance of 'toeing and heeling' and the precision fit of the glass coupled with the pre-fixed sliding spacers made this process a doddle. When fitted the door operation was perfect without any need to adjust the hinges. I am very satisfied with the end result - they are quality products. I found just doors online when we decided to renew our front door. My partner was a bit dubious about using an online site and decided to get a quote from his usual supplier of doors and windows. However the price quoted was more than double than that from Just Doors and we duly ordered our new front door. We were extremely impressedwith the whole process. The ordering was no problem, we had a call back to ensure we had the correct measurements and the door was delivered within a week and has now been fitted. It's a real beauty. A real quality door and easy to fit with two strong men. No problem at all. Great job!! Just wanted to email and say thank you for all your help with our upvc windows. We finish installing them at the weekend and we are very happy with them. My friend who helped installed them works for Everest and he liked them and was pleased with the quality and fit. Service from initial phone call to delivery was first class, I searched the internet for composite doors and found prices about the same, what convinced me to use just doors was the help I received on my queries which was very professionally dealt with. Have used just doors 4 times now and a few big orders. I would recommend to friends they are always happy to help and good value for money. Really helpful people to deal with, they worked around my delivery slots to best suit me and have answered email questions really quickly. Lovely looking door and seemingly easy for my fitter to hang. All in all I would recommend Just Doors to someone looking for a decent quality door at a realistic price. I bought a stable door to fit in my daughter's kitchen. I chose Just Doors UK after lots of research and decided they looked best on price and customer satisfaction. From the very helpful call to check measurements etc, through the negotiation on delivery date, to the very fast reply to a post installation query (about the pressure equalisation vents) I have nothing but praise for this company. I was helped on the installation by a builder friend who was also very complimentary about the quality of the door itself. So overall I'd give 5 stars for quality, value, delivery and service! I was unfortunate enough to have a component fail in the door locking mechanism after nearly 3 years. The excellent sales staff sourced the spare part and had it sent the next day via courier without any hesitation. Excellent professional service which I thoroughly recommend, thanks. We are very pleased with our new back door and although our bathroom window will not be fitted for a while yet we are sure it will offer the same results. We are glad we chose Just Doors Uk and would recommend them. Such a nice surprise to receive this voucher, I can say confidentially that I would highly recommend Just Doors UK for there excellent products and after sales service. The Porch has received many complimentary comments on its appearance from our neighbours. Thank everyone at Just Doors UK for their help. Just fitted the upvc window we bought from you earlier this year, it fits beautifully. I would not hesitate to recommend you, I was a bit worried about ordering such an expensive item over the Internet, but you have made my utility room! I'm very happy with my french doors and upvc windows which are going in my newly built man cave (ah ah) . I also purchased a door for my shed/garage which again I'm more than pleased with . Overall the price and quality and service was spot on. I fitted it all in one day . Will use just doors again. The whole experience was really easy. They will call you to confirm you have ordered correctly, tell you turnaround time and also to arrange delivery within a 2 hour window. Overall a 5 star service. Very pleased with our doors (Front and Back). Service was excellent from start to finish, all my queries answered and the doors fitted a treat . I would not hesitate to recommend Just Doors UK Ltd. I was delighted with the quality of the door and service from Just Doors UK. I had a small issue with a faulty lock and a new replacement was sent out the next morning without fuss. The door looks great and slides and shuts with ease. The one little point is to make sure there is someone fit enough to help the driver to offload the door but he gives you a call with an hours notice that he will be there. I would have no hesitation recommending just doors to family and friends in the future. If you are looking for a new door I can highly recommend Just Doors from the first phone call to the delivery day excellent service high class staff very friendly and helpful from picking the door style and glass and they even made sure I had the right measurements, they emailed me with the progress of the door and frame give me a delivery date, rang the day before the delivery date with the time for the delivery and bang it was here. I ordered a UPVC Door. Everything was perfect, the quality of the door, the price, the delivery, the care taken. Very happy with the look, price, delivery and customer service was excellent. If you're a compeer ten diy person then this is company to supply your doors and windows. French door, back door and upvc window received on delivery time promised. Brilliant quality for the price paid. Excellent DIY instructions on how to fit. Excellent communication on the phone and via email from Chris. Just wanted to say how pleased we are with our composite door. My son and his friend put this in on Saturday (first time they had done this) and it went very well. Fitted perfectly and looks very nice. Kept in touch all the way from ordering to delivery. Quality of doors is great and easy to fit. ?Thank you for great service. Very good service and a super range of made to measure external doors, it is nice to see everything priced up on the website, this is how you got my order! Overall we are very pleased with this purchase and would not hesitate to recommend you, many thanks. Very pleased with the door. very easy to fit. Arrived well within allocated time. Thank you very much. Excellent product, brilliant price and very speedy delivery. Would recommend this site to any one who needs replacement upvc windows or any sort of door. This is our new bathroom window. The man at Just Doors explained that the design we chose 'minster' which was to match our composite back door, was not the highest opaque rating. I explained that we have a blind and he said that would be fine. We love it and it definitely feels more 'private' than the old design we had. Just doors I fitted my door yesterday and it was a perfect fit and great quality. Good quality, excellent service, fast friendly delivery would highly recommend. I'm in the trade and will use again, thanks. Good value from very helpful people, so pleased with the product I have ordered another one! I had a few queries as I've never measured a door before the staff guided me through the whole order until I was happy with the finished order, the delivery was on time and when I saw the door the standard was amazing, everyone has commented on how lovely the door looks. Just Doors is the place to go. The ordering was simple (I sent a plan by e-mail) I found the telephone staff very helpful. The door arrived on time ( no waiting in all day) and I was impressed with the quality. The door is now fitted & looks great I would recommend Just doors. Completely satisfied with whole process. Everything went very smoothly. Prior to manufacture, received a call to check detail was accurate. Very pleased with whole process. Excellent value for money. We purchased french doors, and a composite front door. I have been using them for a few years, they are excellent and dont make mistakes. Would recommend to anyone service could not be better, faultless. Just wanted to say thank you for the excellent customer service we have received from you after one of our window units failed. It is not often things are dealt with so swiftly and well. The unit is already in and it is good to see out of it again! Good door at a good price. Easy to fit. would be handy if the furniture screws were the right length. But overall a good buy. Very impressed with the look, quality, price, delivery and customer service. The documentation that came with the door showed that it had been quality checked at each stage of the manufacturing process. My door fitter said it was really easy to fit as well. If you're looking for a composite door I would recommend these.? I've just finished installing a new door from Just Doors UK. It's a very high quality product, closes and locks effortlessly after just a little setting up. I was a little apprehensive doing the job on my own, but the instructions are spot-on on their download page. I've listed a few points below which may be valuable to others. I had to remove the new door from its frame by undoing the six screws in each hinge because I didn't have sufficient clearance to lower the door onto the hinge pins. Easy enough. I spent a long time ensuring the frame was level and square. I used their fitting pack which consists of plastic packers and frame fixings. You'll need a T30 Torx bit for these. I also used expanding foam to fill around the edge. Use disposable gloves that stuff sticks like superglue! Do get a rubber mallet for the glazing strips - I was glad I did. Also, take a look at Youtube, various people have put out videos on door fitting, toe and heeling and even the hinge manufacturer has a set-up video - very useful. You'll need to buy silicone frame sealant for outside and acrylic for inside. I've noticed that the room is very noticeably warmer than it was with my draughty old wooden door. All round a very satisfactory days work that saved me quite a few pounds!? If you do have any questions don't hesitate to call them. Their sales staff appear to all be experienced fitters who were able to answer all my questions. Fantastic service, great communication from the first phone call until delivery. Very impressed with the service and love my new front door. Thank you. Brilliant quality, great value and the door arrived within a week of the order. I would recommend Just Doors UK to everyone. My old wooden back door almost fell out, the frame was rotten. I wanted to replace with a secure UPVC door. I discovered my door was an odd size! Not a problem, Just Doors UK were able to make a quality to measure and at a most reasonable price. Very helpful on the phone to ensure I got the measurements correct. Very helpful with info on choosing a type, and the fitting instructions to download were spot on, I was able to DIY fit. Door arrived well protected for transit. We started using Just Doors UK a while ago after finding them online. We were so impressed by the service we received that they have supplied all of our windows & doors since. Great value for money, a helpful & polite team & good delivery drivers with a smile on there faces.... which is rare in our business! we have just fitted a very large & complex 5 sided bay (nearly 4m wide) & it went in without a problem. We will never use anyone else again. Very good door for the money. Just as good as Jeldwen. Having studied your impressive web site we made the decision to order a new front door from you. From the time we ordered the door to the time it was delivered we found the service we received was excellent. Ordering was easy, the communication about delivery was good, good quality product, and the price very reasonable. We have just had the door fitted and are so pleased with our purchase. We would not hesitate to order from this company again. Just wanted to say thanks for a great service and excellent product. I ordered a new upvc window for the front room just before christmas, It arrived this Saturday bang on time. Really nice and helpful driver. Started the job Sunday morning and by Sunday lunchtime I was looking at the world through my new fitted unit. Easy ordering, Great customer service and advise, Easy to follow instructions, Easy to fit frame. Easy to fit sealed glazed units.....I just need to learn how to use expanding foam...!! Will definitely be using Just Doors UK again. The door that I ordered has now been fitted to our house in Cyprus. It is of excellent quality and contained clear and unambiguous fitting instructions. The support I received from the Just Doors UK was extremely helpful, I am not a professional installer, and the advice I receive was most welcome. The triple lock on the door is a welcome addition to the security of our property, break-ins are becoming commonplace here now, hopefully it will help us to avoid becoming victims. Excellent ordering process, perfect communication and a pleasure to deal with. Would highly recommend this company. 10 out of 10. Thank you again. I have never used your company before, and was a little worried about buying a new front door over the internet, however right from ordering the door over the phone from one of your sales team, to delivery I have nothing but praise for the prompt, professional way my order was processed, I was most impressed with the delivery time, just 7 working days from ordering, and at Christmas!! I will definitely be placing another order, and would recommend your company. The door itself fitted exactly with minimal adjustment, it all looks fantastic, it was fitted in less than 2 hours from start to finish, and has removed all the draughts from my porch. Excellent French door set, and delivered smack on time. Would use again. Extremely pleased with the quality of our new back upvc door. Excellent communication with the sales team and very timely manufacture. Very pleased with the French doors. There was a bit of a drama with the delivery when the driver got stuck but I will definitely purchase again. A+ BRILLIANT SERVICE, BRILLIANT PRODUCTS, EXCELLENT COMMUNICATION FROM THE TEAM, WILL BE RECOMMENDING YOU GUYS TO FAMILY AND FRIENDS. ANOTHER FEATURE I LIKE ON YOUR WEBSITE IS FULL FITTING INSTRUCTIONS WHICH I FOUND VERY HELPFULL. ?ALSO THE PRICE FOR MY ORDER AND DELIVERY COULD NOT BE BEATEN FROM OTHERS. I WILL BE BUYING FROM YOU GUYS AGAIN DEFFO. THANK YOU VERY MUCH FOR LETTING ME BUY AND INSTALL PRODUCTS FROM JUST DOORS TEAM. 5 STARS EASY SMOOTH TRANSACTION WITH A COMPANY THAT KNOWS WHAT THEY ARE DOING. Can't be faulted. Being a complete novice when it comes to things like this I needed some guidance to the measuring process. The advice I received over the phone was spot on, the door fits like a glove and it looks great. ?Delivery was also a painless process, I was contacted as soon as the door was ready and a delivery time which suited me was arranged and followed through to the minute. ?Overall a great service, which I would (and have) thoroughly recommend. The door I ordered was absolutely fab and the customer service was really really good! I would most certainly recommend Just Doors UK! Great composite door, friendly and helpful staff - both in the office and the delivery men. Top service, brilliant products at very reasonable prices. Would totally recommend to friends and family and would do business with you guys again. Keep up the good work. The door was delivered on time, Sunday morning! The driver and his mate were very good and placed the door in the car port. The sealed glass panel and the bottom panel were not pre assembled into the door, this was a reasonably easy job and the beads went in ok after some trial and error. Unfortunately only the bottom panel was properly packed the door itself and the glass had no packing at all. Excellent service from this company. I fitted the door myself and it fits perfectly; just the job. Many thanks to Just Doors UK and if I have need of them in the future - absolutely no hesitation at all. Ordered 11 windows and back door. Arrived within 2 weeks (9th working day from order) Exactly as ordered and fitted perfectly. Excellent quality and value. The glazing beading fitting instructions very helpful and I became an expert after fitting the first pane. I purchased a white rubber mallet from Screwfix and its heavy weight proved perfect. My only mistake was in not reading on the small print on the Pilkington K glass label notifying the inside face of the glass. I had to remove and turn several panes but no problem as I had now become confident of doing so. The back door was fitted easily, and works perfectly. My house is noticeably warmer and I had no hesitation awarding 5 stars in all categories. Many thanks. Excellent service and delivery. Possibly the instruction sheet could a little more explicit on certain operations but like many tasks it's easy once you have completed it. My composite door arrived on time on the agreed date and very well packed. next day it only took four hours to rip out the old one and replace it with my fabulous new door. However the first time I tried to lift the inner door handle to lock it something in the lock went bang and it failed to work from the inside. A quick phone call to Just Doors and another was dispatched and arrived in four days. I fitted the lock in my lunch hour (it only took ten mins) and everything worked perfectly. Just Doors offer a traditional first class service for a first class product. I will recommend them to everyone I know. Lovely door. Easy to order. No problems with delivery - good communication and on time. Oh, and nice people to talk to. Excellent service, I ordered a composite door & extra glass side panels in upvc, plus a side double glazed window with lead. Order excepted 17th July but I needed delivery by 30th July as I was going on holiday, the lads at Just Doors UK done the job. The window was delivered In a few days and door/frame made to my spec was there on the 29th July. Could not fault the workmanship or the service. Will recommend and use again. Customer service was excellent. Everything from start to finish was handled very well. Would use them again. I had never fitted double glazing before and was a bit nervous of ordering products I had not actually seen and examined, but all the good reviews persuaded me to make the call to Just Doors UK and I am very glad I did. The service was excellent - from a very helpful, friendly and competent ordering process through to a timely and helpful delivery. Everything arrived in unmarked condition and seems to be excellent quality. The installation went without a hitch. If you're a newbie like me- just read the instructions carefully, make sure you prepare everything thoroughly as they tell you to, and take your time. A great composite door, perfect fit. Communication was excellent and always very helpful. The price was unbeatable which made me a little nervous of the quality but I have found it to be excellent. I would definitely use Just Doors again. What an absolutely brilliant company. From start to finish very helpful. The door was delivered securely and very quickly and my wife and I installed it a couple of days later. Makes such a difference to the front of the house. We have had family and friends round and they are very impressed with the quality. Once again many thanks. Ordered the 2 Panel 1 Arch Elegance Composite Door....made to measure and delivered in a week...Excellent service once again (my second door)...so glad you talked me into buying the 3D hinges....worth every penny....Thank you! Back door was ordered. Very helpful staff when I rang to discuss the order. Made suggestions for extra security. Delivery was first class time limit we were given was kept to. Driver helpful. Found the download fitting instructions very helpful and comprehensive. Customer services good, delivery drivers cheerful, good product. Thanks alot. I thought I would let you know that the French doors and side panel, which were delivered on time last week by a very courteous driver, have now been fitted and the whole job looks perfect, I still have one or two little finishing touches, just waiting for the rain to go away. I must add that you and your company have been excellent from start to finish, I had many reservations regarding this job but you and your fellow workers have been very good, your help before and with the ordering of the two items, and delivery on time and at a good price, are not always as good with other companies these days, so much appreciated, you have all come up trumps. Many thanks for your brilliant service your driver was very pleasant and helpful hope the door goes in as good. Once again thanks to you all. The Patio door I ordered arrived within a week of ordering. It is now fitted and appears to be of very good quality. Everyone has been very helpful and the delivery driver was a gent. One thing I would say is about the fitting instructions. Although they are good they would be better if they had a bit more detail for the DIY fitter. I purchased a composite doorand flag window, the product, service and delivery were excellent, advice from the sales team was brilliant. Would recommend Just Doors UK.? Just a line to say I have just received delivery of my door spot on the delivery time. I would like to say that you gave excellent service from ordering to delivery, the product is well made and exactly what I ordered. Can you thank the delivery driver who was very helpful and gave a very good image of your company. I will have no hesitation in recommending and using your company in the future. I ordered a new back door and upvc windows for my bathroom and bedroom. They arrived on time and were easy to fit, customer service the best I have used, driver very helpful and product EXCELLENT. Purchased set of French doors with side panels. Prompt delivery, good price and looks great once fitted. Would recommend to anybody thanks very much. Really pleased with product. Fitted doors myself being a tradesman and especially pleased with adjustment of hinges on upvc doors. Extremely pleased with door. Was a bit dubious ordering this online but after speaking to Kev, who helped me with measurements etc I will be using Just Doors again and have already recommended to several friends. Delivery was super quick and now its been fitted with no problems I am so pleased (and I'm starting to linger in my hallway just looking at door! - or is that a bit sad!!). Overall, excellent product and excellent customer service. To all staff at Just Doors thank you for a great door and side panel excellent quality. Easy to fit prompt delivery. I feel I have had really good attention from anyone I spoke to at Just Doors congratulations! I would highly recommend your company to anyone. I can't praise the service and quality enough, it is difficult to find any areas of the complete service to find fault. However if I am really picky the measurement instructions tell you to measure brick to brick but I feel it should mention to the lintel which can effect the overall dimension. Thank you . The door is great, no problems what so ever. A great service. If I need any more doors I won't be hunting for a suppler, I will come straight too you. Keep up the good work. I wanted to write to say how pleased I have been with both the product and service level I have received from Just Doors UK. I should have written this a few months ago as I have had the door installed since last August. From discovering your website (which I thought was excellent, clear and full of all the information I needed to make a decision on which door to buy) to receiving the door. I had never fitted a door before but the instructions were great and although it took some time! I am delighted with the finished result. The icing on the cake was when I called to explain how the door restrainer had broken and you promptly sent one out to replace it. You guys excel in what you do and I will continue to recommend Just Doors UK to anyone who is looking for a quality product delivered on time and with excellent service." Very happy with the door and the service. An absolute delight to do business with you. Contacts during the order phase were prompt and extremely helpful without being pushy. Questions were answered clearly and fully with the onus on my being fully informed. Delivery was was cheerful and took care to ensure the door and glass were well protected in a suitable place until fitting could be done. Product fitted easily and the finished effect was as envisaged. Thank you!! Great value composite front door and very helpful staff during the order process. Fitted the door myself with no problems. Would use this company again for future purchases. I have recently received my patio door and it is superb. I have used this company on two occasions and both have been trouble free. Good communication, fast delivery and great products, a pleasure to deal with. I've recently had a blue composite front door deliverd from Just Doors. Overall service is fantastic and good value for money. The only gripe I have with the door is at the bottom rain sill (the part that makes the water run off ur door away from the threshold) for some reason they decided to cover the door in a plastic protective coat then glue the sides of the rain preventer. This allowed glue to stick over the protective layer and it has a couple of glue makes that cannot be removed after taking off the protective layer. Basically looks like plastic needs to be removed from the edge of the rain preventer. So the door does not have a 100% clean finish. But apart from that I would recommend this company! I would highly recommend this company for value, service and quality. The customer service was excellent and very helpful with all my quesions prior to ordering. Now my French doors, front and back door have been fitted I am delighted. I intend to order replacement windows in the future. Just had Patio door delivered. Just doors gave excellent communication and service with order, delivery, and gave good telephone and email advice during the process. The product seems good, was a good price and looks good fitted. I had slight difficulty opening patio door when I put it in place and packed, this was resolved once I fitted screws to each corner and it must have helped pull the frame square. For anybody else purchasing patio door I would offer advice that once packed and levelled if the door does not slide fix the first 4 screw to the frame. Very impressed with all aspects of my dealings with Just Doors, excellent service throughout and delivery bang on time. I have fitted my door and frame with ease and the quality of the product I'm delighted to say is superb. Excellent ordering and delivery service. Door looks great. Your customer service is AAA. Staff brilliant, delivery as promised. Door even better than in photos. Thanks for just a great all round service and fab door. Door has now been fitted brillant, excellent delivery service and very pleasant driver, very good contact from your sale team. I would recommend your company ,thank you very much. Very good product at a very good cost would would buy again. Fantastic, brilliant doors, perfect fit, wonderful service and excellent assistance from customer service. I buy a lot of products online, and this is the best company I have ever deal with. Cannot recommend Just Doors UK highly enough. Good quality, good service, easy to fit. 5 stars in all categories says it all. First class service no hesitation in recommending this company to anyone thinking of replacing their doors. A real pleasure to be able to sing the praises of a UK company. We have been very pleased with the door and it's features reducing the draft and cold together with better security. It was very helpful to be able to contact an advisor before and after delivery. Thank you. This is a repeat order after already having fitted a door from you previously. The overall quality of the product and speed of service and delivery were out of this world! Thank you once again for your help and advice at the ordering and delivery stage. Very pleased with this product and the service I received. Thank you. All good for the second time. Good cheap replacement windows. Easy to order, reliable delivery service. Very happy indeed the service and quality of product from Just Doors UK; right from the ease of using the website to final delivery. Will be using again. All as described/shown on web site. Delivered on time. Quality seems very good. A few instructions re adjustment of door once fitted would have been appreciated. Excellent service all round. Very pleased with the whole deal. Excellent company to work with. Your service was brilliant and communication too. Many thanks. Will highly recommend. The best internet service I have ever come across. Excellent. Very good product excellent price. Delivered at time stated, very helpful customer service. Will be using again. Great service from order to delivery. Highly recommended and a great product too. Ordered via the phone. Ordering was easy and found staff very helpful. Delivery was exceptional. Ordered a week before Christmas and expected delivery mid to end of January. Delighted when it was delivered before Christmas. No complaints at all, would go to first. Recommend to anyone. Good product, good price, great service. Will use again. Impressed with the quality, though the locking mechanism does seem to catch or get stuck when both locking and unlocking. Excellent value for money. Not completely happy with the office when they failed to return many of my calls as I was trying to rearrange delivery date. The actual delivery itself was brilliant and the driver was amazingly helpful as I needed the door dropping of at a different location for storage. Have used Just Doors UK for last few years now & they have never let me down, even with a 5 day last minute turnaround. If only all my suppliers where as good as Just Doors UK. Excellent Service, very helpful. Will recommend. Good - Door good quality and as described, good communication after placing order, delivery fairly prompt and as agreed. Bad - Delivery expensive, and the fit pack is a very poor value (and poorly described on your website). Overall happy with purchase, thanks! The staff at Just Doors UK, were helpful throughout the order process with advice on window openings and sizes of fire escape windows to comply with building regulations. At each stage a confirmation email was sent to confirm any changes with clear drawings of the windows with dimensions and openings. The upvc windows were delivered on agreed delivery date from order to delivery date this was only about 2 weeks. The upvc windows were delivered as per the specifications with no issues. I was very happy with the quality of the upvc windows and the service that was provided throughout the process. I also felt that I had value for money with the standard of the windows. I class myself as a competent DIY'er and have never fitted upvc windows before but found the windows easy to fit. I did find that the fitting instructions could have been more detailed or even a YouTube Video to help. Four windows fitted and a very happy customer. Many thanks. Very happy with my purchase just what I wanted. The delivery was fast and the service was very helpful thanks very much. We have used this company on a few occasions now and the service is always excellent. The doors are well made and have fitted perfectly. Will continue to use and will recommend highly. Really good quality and service, had a problem with a bead phoned up and a new piece came in 3 days, excellent after service, many thanks and will definitely be using again. Hello, I just want to take a moment to say that the service I received from you company, staff is way above brilliant. From general information to order to delivery. No fault what so ever thank you very much. The effort that you made to get my order to me on time after failing quality check, and the communication that came with that. Please pass our thanks to all staff. Wonderful purchase, very good customer relations, spot on information, delivery, cannot recommend this company enough. They should be up the front with replacement windows and doors etc, if anyone needs a window or door fitter in North Hertfordshire contact me have found the most genuine and helpful and cost effective fitter ever. Many thanks Just Doors UK. Excellent quality material and value for money. Door delivered on time as promised combined with very good customer service. I would recommend this company to my friends without reservation. Just a note to say thanks very much for the excellent doors. I fitted them today and they look splendid. Apart from being very happy with the doors themselves, I would just like to say what a very pleasant and satisfying experience it has been dealing with your company. From the excellent communication, emails, double checking of the order, the staff in the office, to Mark the delivery driver, who was very friendly and helpful. I WILL be purchasing another set from you soon and will recommend you to all. Good service and communications, are contacted close to delivery date. Door and fittings were as ordered, good quality with no damage. This is the second door I have purchased from Just Doors and are pleased with the level of service and product. I would use again and would recommend to others. We were disappointed with the way the upper and lower parts of our stable door didn't lock together as one door for normal opening and closing. Customer services were very helpful but were unable to resolve the problem. I have been very impressed with the service offered by Just Doors. The quality of the window are as good as ones you would normally have to pay twice as much for. Delivery have always been on time and communication with customer services has been without fault. Overall, I think Just doors presents a, class triple A one service. I ordered a upvc front door and side panel as well asfrench doors I measured all items and they were perfect measurements the quality is fantastic the communication was outstanding and I am very happy and considering purchasing a new set of windows from Just Doors UK. This company is a 5 star. Very impressed with the quality of the door and service. Would recommend. An excellent and very smart door, delivered promptly and easily fitted, worth the money; the Yale keypad lock - which puts the price up more than a tad - is very good and worth it. I purchased some french doors some time ago and they fitted perfectly, they have not been any trouble whatsoever so that's why I decided to come back to your company to buy some window, I would also like to express my thanks to your delivery driver who was very helpful! we are very pleased with the window and thank you all for your assistance and service. UPVC Door, no complaints at all, arrived in perfect condition, customer service pretty good as well, staff know what they are talking about, put me right in a couple of points, would order from this company again, have already recommended. Easy to order delivered on time good value for money have used twice and will be using again. Overall, very satisfied with the service provided. Thank you for an excellent service and product. I will recommend you to others and will use your service again. Bit more printed advice re fitting techniques may be advantageous to a DIYer in my case one of my builders had worked as a fitter, the helped. I would recommend your service wholeheartedly. We have recommended you to friends. So pleased with the two doors and frames fitted perfect, took 40 minutes for each one, works and looks a treat. Collected small window in person. Delighted with the quality and was ready to pick up as requested. Excellent product great quality and price. Excellent service will be buying from you again and will recommend you. I just want to thank you for the professional way in which you handled our order. It gave me confidence when you called to confirm all the details, and I was impressed by the regular updates on delivery time with all the issues your driver had that day. Shame more deliverers don't take the same care. I'd also like to thank the driver for his help and cheerfulness, especially as he did not get here until after 6 pm. Finally, the door was perfect and is now fully installed. I will certainly recommend your services in the future. I cannot speak highly enough of this company, very polite, helpful and efficient. Products are excellent. Great door, excellent value for money, fast delivery! Many thanks for the wonderful french doors ordered from you a few weeks ago. Absolutely brilliant quality and I'll be sure to order from you again. Also big thank you to your very helpful driver. The whole experience was excellent, from choosing the doors, through the ordering process and delivery to installation. Just Doors UK were very professional, they made sure that what I ordered was absolutely correct before the order went through, delivery was sooner than expected and installation was a breeze. I would highly recommend Just Doors UK, to anyone thinking of buying new doors or windows. I was nervous about buying this kind of product off the internet, but clearly I lucked in because the quality of the door and side windows is excellent (my door fitter agreed too!). When I called to say I'd made a mistake with part of my order, the Just Doors UK guys ordered me up new parts and had them wining down to me instantly...great service! Thoroughly recommend this company, even if like me you live the other side of the country. Couldn't be more pleased with the french doors supplied by you, thank you. Couldn't have wished for better, totally satisfied, will recommend to friends and family and would use Just Doors UK in the future if required. Excellent Service from enquiry (Monday) to delivery (Saturday) - ONLY 5 days. Manufactured to a high standard. Would definitely buy again. Just a short note to say thank you for the excellent service I have received from your company in purchasing a Clinton Stable door. The order process was quick, easy & professional. The door was delivered very quickly and exactly when it was supposed to and I am pleased to say that it was fitted this weekend and is exactly what we wanted. A high quality product at a very reasonable price. I would not hesitate to recommend your company to family friends and colleagues in the future." Just to say thank you for your Speedy Timescale of producing and delivery on my order for the french doors. The driver Phoned to say that he would deliver a couple of hours earlier than originally notified which was great and no problems. I can tell you that I have fitted and adjusted the doors yesterday Sunday and they look great. Just need to fit some trim around the frame now. All was as we discussed when placing the Order, thank you." The quality of the product far surpassed my expectations, & the inclusion of top-quality, heavy-duty & beautifully designed door furniture as standard is outstanding value. The external gold-coloured flag hinges & handles on my new French doors are particularly striking against the rosewood finish. I thought I would just drop you a line to say how pleased I am with the door you supplied. Fitting was easy as your measurements were spot on. Beading was a bit fiddly and hinges needed a bit of a tweak but the job looks great. Really pleased - would not hesitate to use Just Doors UK again. Hello there, I'm Gary McClelland and I recently purchased a door and window from you, it was delivered on Sunday just gone at 10:30 on the dot which was the start of your estimated delivery time, the people who delivered it to my customers house were extremely friendly and helpful in every way, a perfect representation for your company. The door itself was delivered in immaculate condition with every effort gone into protecting it whilst in transit. The cost of the door did not reflect in the quality which I thought was very high and of a very good standard. This is my first time dealing with your company and from the very start with my phone call the service has been immense Kev could not of been more helpful friendly and knowledgeable and speaking to him for five minutes I felt I'd known him for years. So I just wanted to say THANK YOU for your start to finish tip top service I will DEFINITELY be using you from now as my main supplier and hope that this service continues." Door panel was not cut to correct size had to cut down although size was printed on the panel. Once again an excellent experience from beginning to end. Delivered at 9am fitted and finished by 12, perfect fit and quality second to none - thank you!! Thank you for your prompt service and quality of goods. The delivery driver was so helpful. I will definitely be recommending you to my friends. Very impressed from start to delivery with everyone I dealt with. Will definitely recommend you and be using you again when replace upstairs windows. Excellent service from my email the contact was very good and to know I could call up to 8 in the evening was very good the response from the staff at the factory right up to your delivery driver was excellent your driver was very helpful and cheerful and it was 8.15 on a bank holiday Sunday morning once again many thanks for a quick service. Fantastic service, excellent quality product and great price. Your company came highly recommended and I can see why top quality well done. Very impressed with the customer service provided, and the quality of the door seems to be of a very high standard, our fitter also felt that the door was of a very high standard. The door provided is built to last ! Just a quick email to say how pleased we are with the french doors. Very fast delivery from the order time and excellent quality doors exactly to our specifications. Thanks again. This is our second door this year, we moved so had to have another one, very pleased. Very satisfied with product quality and service, no problems what so ever. Another order executed in an efficient courteous and professional manner. My thanks to you all. Thank you for a fantastic service, doors great, delivered on time with no fuss, thanks. A very good experience from online order to delivery. Very helpful from order to delivery, communication very good. Door arrived as promised, well packaged and ready for fitting. Looks excellent. Would recommend. Thank you. I would just like to send you a short thank you for the standard of quality and service that I have received. From initial order to delivery the transaction has been outstanding and this is not an over exaggeration. The quality of your customer service is second to non as you have consistently kept my wife and I fully informed of any pending obstacle or query. Absolutely, Brilliant! Thanks once again! I would like to thank you for the service you have provided over supplying this door to me. From the initial ordering which was very simple, to the phone call from you to check measurements was amiable and easy. The timing of the delivery was spot on and the delivery driver was more than helpful. I would not hesitate from recommending your firm to anyone in the future. Just to let you know delivery arrived ok will take before and after pictures and send early next week. Just like to say thank you for your lovely service. So nice that you change that window quickly with no hassle and just as I wanted it. I would certainly recommend you to friends and family. Service with a smile from delivery men doors great and now, so is window. I was very impress with your customer service and the quality of your product. The ordering process was very easy and the delivery was on time and in just 2 weeks. The door is now up and looks better than I was expecting! So thank you. 1st class door, well made good valve for money and arrived on time. THANKS. From initial contact to delivery service was excellent. I had to change the size when order was confirmed because I had omitted to calculate for the sill, but that was no problem at all. Delivery was done at my request within a week. door arrived Friday and I installed it Saturday. I'll be back again for a new window in a bathroom. I can highly recommend this company for their quality product and professional service. The builder who installed my windows and door was extremely impressed with the quality. Buy with confidence. Well done and thank you Just Doors. I'll buy again, first class all round. Will use Just Doors again, great doors and on time delivery. Would just like to say thank you for our doors they are great. Also the customer service and delivery were excellent, will be recommending you and definitely using you again. Although I was away and in an area with no signal, so unable to help your driver with directions, he persevered and the door was safely delivered when I returned home. The door looks good and my thanks to the driver for his extra effort. I have been fitting composite doors, pvc windows etc, for many years now but I have to say the quality of the composite door you supplied me for my own home is by far the best I have come across. I have already recommended Just Doors UK to several people and will continue to do so in the future, without question. Great communication throughout, delivered on the dot, fair price for a quality product. Many thanks. We would like to thank you for supplying an excellent product that was delivered by very courteous delivery service, was manufactured to a high standard and looks great. I installed it myself - so discovered there was no lintel above the old door - nevertheless, as the attached image shows, I installed the door (complete with new lintel!) and it fitted perfectly. We are delighted with the final look and would highly recommend your product. Item exactly as ordered and delivered at the time advised. Just doors staff very friendly and helpful with all my queries. I can recommend this company to anyone. Just a short email because I fitted the doors this weekend. We are very happy with them. Thank you very much. An overall great service experience. From the wide range of options and the help & information sections on the website through to the interactions with staff, everything was spot on. Really helpful and personable staff and an extremely fast turnaround time from ordering to delivery (3-4 days!). Will definitely recommend to friends. Thanks! Would of thought glazing packers would be supplied, I`ve dealt with other firms who`ve provided them as standard practice. Door was delivered on time but with only a single lorry driver who was unable to unload safely by himself. My wife did help but hurt her shoulder in the process. What would have occurred if there was no body to help? Probable damage to the door or driver? Just to let you know I have now fitted the door, and must say it is truly excellent. Very impressed with the quality of materials and workmanship, and at a very reasonable price. Delivery was as promised and on time. Communication and customer service were first class. Congratulations on a superb product. My husband Andy and I are absolutely delighted with our smart new front door.? Thank you so much. We are really thrilled with our french doors. Everything from ordering to delivery has been first class. We would have no hesitation in recommending your company. Excellent company, excellent product! Sales team very patient with organising size of door that I ordered and making sure it was going to be right. Very fast manufacture and delivery of my door. Excellent product! The door fitter I hired to fit it said it was a fantastic quality door and the price was excellent! Will certainly be using this Company again to buy future doors & windows! Very recommended!!! A good website you can follow. Price of product you choose is EXCELLENT SERVICE. Fitted the door myself following Just Doors instructions with no problems, it looks very nice displayed. Just doors responded with in 24 hrs to confirm order, (even over the Christmas hols) Received confirmation of order by email with 24 hrs to rectify if incorrect. Received phone call 48hrs before delivery with expected time of arrival. Delivery van arrived 15 minutes early. I would like to pass on my sincere thanks to your whole team, right down to the delivery man, who organised the production and delivery of our beautiful composite door. It sets off the whole house which has had compliments from neighbours and strangers alike. Thank you for your phone calls to keep me abreast of the order and right bang on time, it was here, superb service. Very many thanks. Staff were very friendly and helpful the door I purchased was of very good quality and looks really great now its in place, I would recommend Just Doors & Windows UK Ltd to anyone. Was very pleased with everything, from when we first ordered the door delivery and the quality of the door, service was excellent. Very good communication. Polite and helpful staff. Delivery second to none. Front door excellent quality, would recommend to anyone. Many thanks. I'm absolutely delighted with my door. From start to finish the whole process was so easy and so professional. The man on the phone was really clear and confident the delivery men were absolutely punctual and really pleasant nice men. My joiner that's fitting it said it's the best door he's ever done. I can't praise it enough I love it, it's going to make me happy each time I walk through it! How brilliant!. I would appreciate it if you could pass on my thanks to all your staff as an incentive to keep up the excellent standard of work I have experienced with my recent order from Just Doors. During both my phone conversations with Steve, to discuss my requirements and place an order, I was impressed by the time he took to explain my options, prices and methods involved and to get the details exactly to my liking. I haven't had need to measure up, order and fit window / door frames before and his approach was very useful. Thank you. The turnaround was fast and prompt and the standard of delivery was just as good as the previous steps of the service. I was given a useful time window for delivery instead of being asked to stay in all day. The driver was polite, efficient and helpful. Much appreciated. One pager with installation tips and tricks would be great. The quality, value and delivery are super. I am very happy with the good service. Right choice. Thank you! I wanted to write to say that we had our front door fitted today and we are absolutely delighted with it. It is a fantastic product and we anticipate coming back to you in the near future for a side door. A professional carpenter friend installed this door for me last week. He said the quality is as good as he has seen. The installation was straightforward and simple. I'm very happy with the product and it's achieved exactly what I wanted at a fraction of the price of previous quotes. We were very pleased with the door and received very friendly customer service. Thanks for your service and great products and prices, we will definitely use you again and recommend you. Is it too early to wish you happy Christmas and a prosperous new year! Great products, first class delivery, many thanks will defo be buying the rest of our doors and windows from you. Thanks for the excellent service and door, I managed to get it in before the recent change in the weather. Looks good and wife pleased ! that's priceless. The early delivery allowed a full day for fitting. Many thanks. I just wanted to thank you for the professional service I received re my window order. Even though I managed to order the wrong amount of Georgian bars nothing was too much trouble. I will definitely be back to order doors and windows for kitchen. Cannot fault anything really, we had our French doors and back door fitted by a fitter who works for Everest and even he was impressed! Absolutely delighted with door, service exceptional, many thanks would recommend to anyone. Really friendly and helpful attention from all at Just Doors means that I would have no hesitation in using them again. My builder was so impressed that he made an order for a different job. We had some issues that were not anything to do with Just Doors, but they couldn't have been more helpful in resolving them. Of all the companies I've used on a major refurbishment project, Just Doors have been the best. Helpful and informative staff, delivery exactly as promised, installation went without a hitch. Thank you for a first class service. Very pleased with windows. Good quality, delivered on time. Would definitely use company again. So happy with the quality of the product, also the standard of work by the fitter. Would not hesitate in dealing with this company again. Delivery time estimated between 11am & 1pm, door arrived at 11am. old door out new one in by 1.15 pm. job done. Another order completed and delivered in a professional friendly and helpful manner, many thanks to Dave and Steve. To all at Just Doors, what a team!!! from ordering to delivery in 8 days, our french doors look fantastic!! many thanks to you all, we will certainly be using your company again, many thanks! We missed the "Pre-warning of Delivery" phone call but nevertheless the delivery turned up within the agreed timeframe. Two missing cill end caps turned up next day without even being missed by me. (There were two inside the door frame, anyway). I've never fitted a PVC door before but downloaded the instructions and followed them to the letter. After "Toe and Heeling" all that was required was a tweak to the hinges. From the fellow who talked me through my order placement to the guys who placed the door out of direct sunlight it has been a First Class experience. Lovely door and lovely company. I will recommend them to my friends. Many thanks Just Doors UK for the excellent service we received on the purchase of our patio doors (3660x2420), the door was competitively priced compared to other manufacturers, and the delivery was really quick considering it's size, we will definitely be recommending you in the future. Thanks again. Thrilled with my door. Thank you. Any doors I have in the future will be brought from you. The french doors were a top quality product at a very good price. I would recommend to anyone as the whole ordering process was very easy and the staff were nice people to deal with. Overall an OK service. Got the job done. However the delivery was moved back which was not good. Thank you so much for your quick no quibble response to our problem. It's great to see a company that stands by its guarantee. Such a welcome change. I would recommend your company to all. First class product, First class service, easy to install, the people that I dealt with were extremely helpful and courteous at all stages of the transaction, Many thanks. I would recommend Just Doors to anyone. So pleased with quality of door and colour has definitely made the house look great - glazier said quality was excellent and would recommend to others and the glazier is now going to go to Just Doors in the future. Thank You no heavy sales and nice people to deal with. Thank You. Dear Sirs, just a courtesy note to say that the Patio doors arrived as per your notification, your 24 hr pre-call, and your driver call 20 mins from delivery. I would wish to say.first class service and I'm very pleased with product which is fitted and looks good. I just wish all companies had the same work ethic. Well done and thank you. Excellent service and product, easy to follow online instructions. l'll certainly use and recommend Just Doors again. I recently bought two exterior doors from you. They have now been fitted and I am really pleased with them, delighted with the help you gave in response to queries and delivery was very speedy. I would have no hesitation to recommending to anyone needing doors. When reading the reviews on the site I did not think it could be true in this day and age but we are very impressed with your service provided from start to finish and the doors are top standard. Thank you. Received door and window, had them fitted, very happy with your product, many eye lookers and question are being ask where was it made, thanks again. Couldn't fault anything, from ordering to delivery.Superb service, door came with good instructions making it easy to fit. quality was excellent. thank you. Superb all round 5 star service. Customer service second to none, very friendly and helpful. Buy with confidence. Thank you very much. Not only was your firm the most competitive on price/specification in the first place, but I now see that your after-sales service is also excellent, even after a year and a half. Hi, Have received replacement handles as promised, thanks again for outstanding service and quality, will recommend Just Doors UK every chance I get. I was so pleased with a previous order. I once again used Just Doors UK for my latest project, I received excellent advice and help when ordering. I highly recommend this company for their customer service. 5* Product, 5* Service, 5* Staff. Could not be more pleased, the Composite Door looks fabulous. My fitter says it's the best door he's fitted and it's got a Yale locking system another bonus. Saved us 100's of pounds on two doors, will be measuring up for windows shortly and wont even bother looking else where. A first class service from start to finish. Excellent assistance with my order and very prompt delivery. Hi, I would just like to say a big THANK YOU for sending the door lock for me, in very fast time. It came exactly as you said it would, and was easy to put on as explained. Your customer service is excellent. I will recommend you to anyone I know who is in need of a new door. Thanks again. Just a note to say thank you for another trouble free transaction with your company, again an excellent door, fitted in an awkward position following your measuring instructions without any problems. Friendly service both on the phone and from the helpful delivery driver. Would recommend. I wanted to thank you for the composite door and side panel you have just supplied. The quality is excellent and the service brilliant. It has been a pleasure dealing with you from start to finish. You are all extremely knowledgeable and have been very helpful. Thank you all. Purchased a upvc back door last year and found the service and quality excellent. Installed the door myself and found the purchase of the installation kit made the job easy. Door quality was brilliant and the on-line installation guide was easy to follow. Had a small problem with aluminium swarf in the sealed unit but this was replaced without hassle. Brilliant company and product, would buy from them again without hesitation. Dear Sirs It's not often that I write a letter in praise, but I must say that your service has been perfect from the sales to delivery. Sales very knowledgeable, and delivery right on time with very pleasant drivers. Door is now installed and working less than 8 hours from delivery. First time I have ever installed a new front door but it all went perfectly. Great quality product. Well done, I will certainly recommend yourselves in the future All the best. Really pleased with the whole package. Staff helpful and friendly and knowledgeable. My new front door looks lovely. Thanks will use and recommend you again. Just a quick note to thank you for your service with the above order. The door and windows were delivered on time and to specification. All are now installed and working exactly as they should and they look great. I wouldn't hesitate to recommend you to friends and family (and on your website, if that is what you wish). I have one more window (a bay window) to replace, which I will probably do in the Autumn. I will contact you then with the details to get your advice and a price. Hi thanks for delivery, very impressed with product, fitted today went very well, will certainly recommend your product and certainly will be using your product again. kind regards. Firstly, many thanks for 3 excellent doors. I am really very pleased with them and their quality. In a couple of years time, I will certainly be returning for windows! I received delivery of my door on Wednesday 30/3/11 and have now fitted it. I just wanted to say how impressed I am with the quality and appearance of the door. It is a real quality product and I will highly recommend your Company. I also found the service very efficient from ordering to delivery. Kind Regards. I have never used this company before, very pleased with my new back door. I will be using them again in the future. Dear Just Doors, I recently had a door delivered. I just want to thank everyone there involved in delivery and manufacture of the door. It is perfect. The old door was out and the new one in all in one day with no hitches whatsoever. Thank you all so much. It's not often I find outstanding service that I would happily recommend to my friends but your company is an exception! Thank you! Kind Regards and Best Wishes. Very pleased with the door and service from this company, thanks it looks fantastic and has been commented on by all who have seen it. Excellent products, excellent quick and helpful customer service. Will use again and recommend. Hi Steve, I would like to say thank you for your prompt service, the door was delivered as promised on Sat; I am well pleased with this order. Just to say I took delivery of the new back door today. Your driver (sorry I think he was called Mark??? ) was extremely polite and true to his word when he said he would be at my house by 11am. He was prompt and polite. I have had the door installed today and my joiner is just putting the finishing touches to the internal brickwork ( my old door and frame was solid mahogany and fitted extremely well!!!) and just some work to do outside tomorrow and the job will be complete. Thank you for your prompt and helpful service and I will not hesitate to recommend your company in the future. Dear Chris, Steve and the rest of your Team, thank you very much for supplying the door I ordered and for delivering it to my mother-in-law in Mickleover. When I inspected the door I was, like my mother in law, very pleased with the quality of the product - much better than those I had seen in B&Q etc. Whilst visiting over Christmas I installed the door and followed your instructions / advice from your web site easily. The only problems I had were totally out of your control - a non-square opening in which to install the door and some very very cold weather. I'm please to say that my mother in law is very happy with the final result. I may be in line for a composite door for my own house later this year / early next - but that is dependant upon having some other work done to the house first. If we do go ahead I'll be back in contact. Thanks once again. Hi Chris, I would like to say a big thank you for all the help and support from you with the stages of getting the windows to fitting them. Quick delivery and excellent quality. Just had our door fitted, and could not be more impressed with it, even the guy who fitted it was impressed, thanks once again for all your help, your service was first class. Couldn't be happier with my door and despite the adverse weather it was delivered exactly as advised. A big thank you to your delivery men for their efforts!! Just wanted to send a quick email to say that I bought a door from you which arrived last week. I have had it fitted and am so delighted with it that I wanted to say thank you. It was well worth the money. The quality is amazing. It feels heavy and very secure and it looks brilliant. Passers by were asking where it was from and what kind of door it was whilst it was being fitted!! Thanks again. Hi, I just wanted to send an email to thank you for the most fantastic doors, received them, as agreed, and they are even better than I thought. Great service, and top quality doors, I will be recommending your company to anyone who asks, and will be back to order some new windows in the new year. Thank you again for the top service. Merry Christmas. An excellent website and friendly and helpful service with our recent order there was a problem with the lock on the door and one phone call a new one was promised and received within 48hrs that is proof of a really good company . . . . . . . thank you. Will recommend to friends and family. Good service no fuss ordering kept informed progress of order and del dates. good product. Dear Sirs, we just wanted to write and thank you for the outstanding service we have received from Just Doors. We placed our order last weekend and our two French doors and back door were delivered today - 5 days later. The driver contacted us with the exact delivery time and was true to his word. We are absolutely delighted with this order and will most definitely use your company again. We have already recommended you to somebody else and will continue to do so! Door arrived nice and early. thank you. I would like to recommend Just Doors UK. The service from start to finish has been top quality. The prices were the best online and the doors were delivered exactly as promised. The quality of the doors were also very good. Many thanks for a first class service. From order to delivery in just over a week. thanks for being so helpful in despatching my door so promptly. great service, really helpful staff, ordering/paying made easy and most important great product. thanks again. Hi Steve/Chris, Thanks for the doors on Friday, had them fitted over the weekend with no problems, and they look great, no adjustment needed on the hinges. Just one comment, one of the hinge covers has a scratch on it, I guess this may of happened in transit, as I did notice it before fitting. I wonder if I could send this one back for a replacement. Apart from that great service, great doors, and I will pass on your details to friends and family. Hi Steve, Thanks very much for the rapid delivery of the replacement gold screw. Your service overall has been excellent - very helpful with various questions at time of ordering, delivery on time as promised, all three doors were well protected in transit, very competively priced and the doors look very good now they have been put in. I have already recommended Just Doors UK to a number of people. Thanks again for your excellent service. Hi All, Thank you very much for delivering my Reagan one crystal door early, I am very pleased with it. I had it fitted today and it looks very nice, well worth the wait for it to be made to measure perfectly. I will definitely recommend your company to all my friends and family. thanks again. Hello, I ordered a upvc door from you a few weeks ago and it arrived this morning. My friend and I fitted it this afternoon and I would just like to say thank you. The product quality is extremely good; none of the parts were missing (very unusual these days); the communication and delivery information was good and informative without being over the top and I have been very happy with the service. So many people complain when things go wrong but they don't often acknowledge when things go right, so I would like to take this opportunity to say Well done and thank you for the now non-draughty kitchen which we have. Happy Christmas! Hello, I would just like to say how pleased I was with the service that you supplied. The door and window that I ordered were very good value for money and I managed to fit them both in a couple of hours. Overall, it was an excellent service and you provided. Many thanks, you are a credit to the internet. Just a quick email to say thanks very much for the excellent service received. Great communication throughout, from the man taking the order, the phone call to arrange delivery and to the delivery of my new 4 Panel 1 Arch Crystal Tulip Composite door, the service has been second to none. I have just put the composite door in this weekend and it looks great, fitted without any hassle at all. Would recommend your company to anyone who was looking for doors or windows. Excellent service and excellent prices. Many thanks. I recently ordered some patio doors from you. I would like to say thanks, they are great. It was so helpful to be able to get a price on made to measure doors straight away without any sales person calling or coming round. Thank you for a great service and product. I will certainly recommend you to everyone that I know! Hi, fitted the door yesterday and just thought I would say thanks for the great service and the quality product you provided at a very competitive price, delivery and communication was spot on, it looks great and was so easy to fit/adjust have recommended you to friends and family and will be ordering the back door from you in the near future thanks once again talk to you soon. Just a note to thank you for the brilliant service and lovely door. I will now be saving up for a new back door! And will definitely be ordering one from you. Thanks for great service, quality and delivery in a short space of time . Would have no hesitation in recommending you on. I would just like to take the time to thank you for your excellent and friendly service on recently purchasing a front door, back door, french door set and single window. I would highly recommend your service and in these days your commitment to satisfy the customer where many other firms fail. Thanks again. Many thanks for the door delivered two weeks ago. I was very impressed with the service you offered, checking that all my requirements were met and that it would fit when it arrived. And it did! The quality of the door is excellent. The delivery service first class. Many thanks again, would recommend you anytime - Very satisfied customer"
Doors received ok. I am very pleased with the doors and window, dealing with justdoorsuk has been a rare pleasure. Thank you very much for the service, I will definitely be using your company again and have already begun recommending you to my trades colleagues. I fitted my new door and it looks fantastic. Very pleased. Just a quick note to say thank you for such excellent quality. I was originally shocked when quoted ?1200 by a well-known firm of upvc specialists for one front porch door. Infact we needed two, an external front door and an internal porch door. Convinced we couldn?t get anything more reasonable I searched for upvc doors using Google, on the off chance that something suitable would come up. To my amazement, Justdoorsuk.com popped up and offered made to measure, high quality doors for ?300 each. Initially we were a little sceptical about the quality as for the price I was convinced they would have been flimsier than others. However, when they arrived it was clear that they were a bargain, extremely well made and very secure. We?re so happy with them and the security they have brought to our house that my Mum and Dad, who too were a little sceptical at ordering upvc doors over the Internet, now have their heart set on ordering a set of upvc Patio doors through Justdoorsuk for their living room. Thank you once again. Just a quick email to say thanks very much for the fantastic service received. I haven?t ordered before but it couldn?t have been easier. The delivery came when expected, the driver was great and gave us some tips on fitting and we?ve just put the doors and window in this weekend without hassle at all. Thanks for a great service ? we?ll be back for more. I am just emailing to say that our door arrived this evening, on time. We are delighted with it and the service we have received from your company. Your site was easy to use, when we called, yours guys were very helpful and knowledgeable, and you did what you said you would and delivered the right product at the right time. Sadly, this is a rare occurrence these days and we thought that it was great to be able to email and say THANK YOU instead of only contacting a company to complain or chase ! !So please pass on our thanks to your team. I would like to thank you for the excellent service that you have provided, in relation to both supplying and delivering the Ayres Clarity Sapphire with fittings. The quality of the door is of a very good standard when comparing it to other products of a higher price range. My husband is a joiner, and was very wary about ordering on the internet. He needn't have worried. . . the door you supplied was equally as good quality as products costing double the price from local suppliers!! It was a perfect fit and the door furniture was also of a high quality. The service we received was exceptional. I ordered the door over the phone with Chris who was extremely helpful. He phoned exactly as promised to let me know when the door was being delivered and the delivery time was spot on! Only 11 days after ordering when local suppliers were quoting about 3 weeks. Many many thanks for my beautiful door, panels and window. They fit and look beautiful, I am so pleased with them and the fantastic service you have all given me. We would just to like to say thank you for such a professional service your company has provided, we are extremely happy with the installation and after care service, we will definitely be recommending you to our friends and family. Door looks great, on time delivery and good friendly service.